Our Children. Your Tax Credit. Their Future. College Admission: 99% of Lancers go on to college. College Scholarships: Each year, Salpointe graduates earn over $20 million in college scholarships. 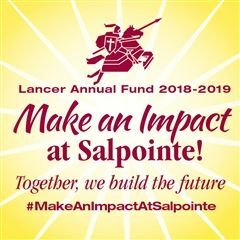 Community Leadership: Salpointe's holistic curriculum and Camelite charism of prayer, community and service are educating our students to be thoughtful, intelligent and hard-working leaders for the future of our community. There are more than 600 Salpointe students who desperately need your help. We have far more need-based financial aid requests than we can meet. Join us in our mission to provide a holistic, life-changing education to students in need. For those of you who have already made your contribution, we are forever grateful! There's still time! Join us in our mission to provide a holistic, life-changing education to students in need. Designate Salpointe by April 15, 2019! Learn more about individual contributions. Our students graduate as educated, thoughtful and hard-working citizens prepared to strengthen our community and advance our workforce. Invest in the future of your business today! Learn more about corporate contributions. The Arizona Tuition Tax Credit Program allows Salpointe to provide critically needed tuition assistance to over 50% of our student body. A School Tuition Organization cannot award, restrict or reserve scholarships solely based on a donor's recommendation. A taxpayer may not claim a state tax credit if the taxpayer agrees to swap donations with another taxpayer to benefit either taxpayer's own dependent. Salpointe students are forever grateful for your support!